Please see the quick links below to some of our more popular posts/pages or see the side bar for even more posts. UV Bulbs; a Problem of Quality? 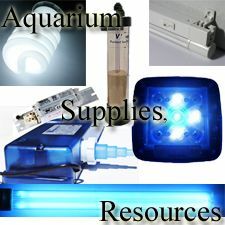 THE Premium UV-C Sterilizer/ Clarifier for Ponds or Aquariums! Hey.. nice list of supplies and information here. I like your discussion of UV bulbs. Do you use them in your larger tanks or smaller tanks as well? Website is looking better than ever. The new organization makes it much easier to navigate to the information you want. I like it a lot. Clean and simple. Exactly how long did it require you to publish “Home – Aquarium Supplies, Resources”? It also has a good deal of really good info. Hi! I’ve been reading your blog for a long time now and finally got the courage to go ahead and give you a shout out from Atascocita Texas! Just wanted to say keep up the good work! Very interesting I have a 125 gallon freshwater planted aquarium. I need to replace my home made set and buy a co2 tank. I have the accessories already, I simply need a tank, filled preferably. A 2.5lb tank would be great, but a 5lb tank would work too. There is a welding supply house an hour away from me, but was wondering if maybe there was a variety of different places to buy and I just don’t know it?